Balanced Scorecard approach proposes to develop a strategy maintaining a balance depending on 4 perspectives: Financial, Customer, Internal Processes, Organizational Learning. What is the value created for shareholders? What is the value created for customers? What is the performance of key processes for success? What is our capacity to grow? 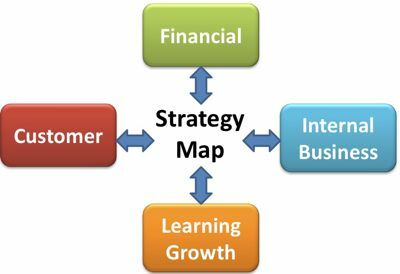 The Strategy Maps are the system's main point. They are the expression of the strategic assumptions and define the cause and effect relationship between the measures of the selected results and the performance determinants. Every measure selected for a Balanced Scorecard should be part of a chain of cause-and-effect relationships that represent the strategy. Robert Kaplan, David Norton "The Balanced Scorecard"
The establishment of Strategy Maps requires a more substantive work. The quality control system depends directly on the relevance and credibility of the Strategy Map.